Romance, puppies, happiness, and death- wait, DEATH?!? Hey guys, it’s Amy! So, as many of you know, I’ve only ever done one review for a review request- Mama Cried by Talia Haven (which I totally loved), so this is my second ever! I’m writing this on August 5th, so this is my first day of vacation, and I’m trying to get through my “stack” of eARCs. So far, I think I’m doing pretty well! 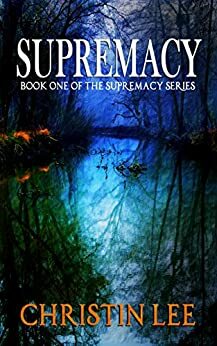 This is a review for Supremacy by Christin Lee. Let’s get started, shall we? Kate is attempting to rescue an injured dog one day when she runs into a man whose bike has broken down by her side of the road. She is able to fix it for him, and after that, she continues to run into Lucas everywhere. Her best friend Sofia pushes them together, while another friend tries to pull them apart. Soon, she realizes there is much more to Lucas than he’s revealing, and she attempts to learn more about his past and why he is so secretive. There was a bit of an insta-love thing, but although the “feelings” were immediate, the relationship progressed fairly slowly (at least physically), which evened it out a bit, and I was able to get used to it quickly. Kate’s relationship with Lucas gave me mixed feelings- on the one hand, they really liked each other, but on the other, she was actually afraid of him, and that is both unhealthy and hard to ship! As for Stephen (one of her best friends), I was very unhappy with the way he turned out. I had hopes that he would get over his reservations, but there is no excuse for that kind of behavior, and I was glad that Kate was upset with him. I really liked Kate’s family- her brothers and dad were extremely protective, which was both sweet and hilarious to watch. She definitely provoked her dad, but I liked that they were slow to come around and each had their own personalities and history. For the magical realism (I wasn’t sure exactly what to call it, and since we don’t have all the details, it may lean more towards fantasy), I was pleasantly surprised! I had my prediction on what Lucas’s background was, and I was happy to see that it was different, more complex, and much more interesting than I had expected. I struggled with Lucas- I mean, the author writes him in a way that makes him incredibly hard to dislike, but his past also makes him incredibly difficult to like. But I appreciated his multi-layered personality; it made him more real, and not as easy to figure out. OH. MY GOSH. I CANNOT BELIEVE THIS. I DIDN’T KNOW IT WAS A SERIES. WHY. WHY MUST AUTHORS BE SO CRUEL. AHHHHHHHHHHHHH I NEED THE NEXT BOOK. NOW. WHYYYYYYYYYY I HAVE SO MANY GOOSEBUMPS AND I THINK I MIGHT CRY. EVEN NOW, I’M GETTING GOOSEBUMPS JUST THINKING ABOUT THAT ENDING. WELL PLAYED, CHRISTIN. WELL PLAYED. I have no idea whether the second book is out yet, but if it is, I’ll be downloading it and reading it ASAP, and if not, I’ll be eagerly awaiting its arrival! I’d definitely recommend this book to anyone who loves YA romance and likes magical realism. Okay, I’m off to go stalk this series. Wish me luck! Toodles! ‹ PreviousI LOVE NETFLIX. AS IN, A LOT. Next ›It’s FANTASY. And there are ASSASSINS. I LOVE IT! Ha, another fun review. A great ending can make up for a lot of weaknesses, I think. Haha, absolutely! I ended up really enjoying it, so it was definitely worth the read. Awe, thanks! You just made my day! XD It’s a combination of Coschedule and my genius brain. Kidding. Mostly.